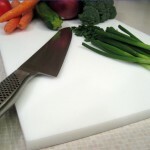 Mapletex Cutting Boards – 6 pack – Monroe Kitchen Equipment, INC.
Mapletex is the best formulated food handling board available. The strong, flat surface opposes most staines and odors and is easy on your cutlery. Mapletex is made with layers of resin impregnated paper sheets which have been fused together by a balanced pressure-temperature process. The exclusive surface of “Mapletex” is NSF listed and FDA approved in the USA and Canada.